As the weather begins to warm up and amusement parks open for the summer. Many of us will be riding roller coasters and rides that spin. Amusement park rides can be a huge thrill, but they can also create a pain and tenderness throughout the neck and low back regions. The high speeds and quick jerking movements of roller coasters and spinning rides can cause whiplash type injuries to the riders. 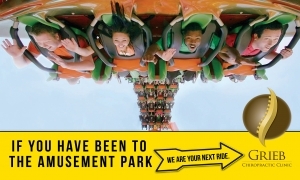 Grieb Chiropractic Clinic provides gentle techniques in the rehabilitation and pain relief after being injured or spending the day at an amusement park. Come into Grieb Chiropractic Clinic today to receive a free evaluation!